Gloria Dei has global partners in Guatemala through companionships with the Catholic Mission at San Lucas Tolimán, and the Iglesia Luterana Agustina de Guatemala (ILAG). The congregation also supports a staff person in the Iringa Diocese of the Lutheran Church in Tanzania (ELCT). Gloria Dei’s global companionships center around the spirit of accompaniment – “Walking together in a solidarity that practices mutuality and interdependence in mission.” With our Lutheran companions at the Iglesia Luterana Agustina de Guatemala (ILAG) and our Catholic ones in San Lucas Tolimán, we uphold the values of mutuality, inclusivity, vulnerability, empowerment, and sustainability. Unlike traditional “mission trips,” visits to our companion partners encourage the common goal of building relationships with our family in Christ. Learn more about accompaniment through this ELCA study guide. The San Lucas Mission was originally founded as by the Franciscan order in the late 16th Century with the building of the Mission Church around 1584. In 1963, in response to the Catholic Church in Rome’s call for deeper involvement in world missions, Fr. Greg Shaffer from the archdiocese of New Ulm, MN went to San Lucas Tolimán to begin work as a parish priest. The focus at the San Lucas Mission has been to respond to the expressed felt needs of the people, working to build the infrastructure so that the people might grow out of the process of poverty. Socio-economic programming at the mission is based in Christian Social Doctrine and is designed to develop five basic human rights: food security, shelter, healthcare, education and work. Gloria Dei has had a 20-year partnership with the Catholic Mission at San Lucas Tolimán. Delegations have helped in dental clinics, constructed the women’s center, built fuel-efficient stoves, nourished seedlings for reforestation, and much more. The Iglesia Luterana Agustina de Guatemala was founded in 1991 as Guatemala suffered through a catastrophic and deadly 36-year internal war. The church members come from the margins of Guatemalan society, people of few material resources and who are predominantly indigenous. The first churches of the ILAG were formed in Guatemala City among internally displaced persons who had fled into the city during the war and were living (and still are living) in the ravines of the city. Gloria Dei has had a partnership with the ILAG for more than a decade. We are partnered with El Mirador Colegio (primary school) in Guatemala City as well as the congregation of La Resurrección, located in the El Tuerto neighborhood of Guatemala City. Visiting our companions in the ILAG generally includes worshiping, praying, and eating together, as well as leading students at El Mirador Colegio in a lesson and activities. Once a year, a delegation from Gloria Dei travels to Guatemala to visit our companions. 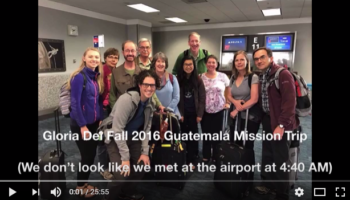 A typical trip is one week long, with time being spent with in Guatemala City with the ILAG as well as at the Catholic mission in San Lucas Tolimán. If you are interested in traveling, please contact Julie Marcotte. Members of Gloria Dei are in Guatemala visiting our mission partners at San Lucas Mission and the Iglesia Luterana Agustina de Guatemala. View our trip video from October 2016. A team of GDLC friends traveled to Guatemala during Day of the Dead and All Saint’s Day. Come and see what our Lutheran and Catholic partnerships look like. We hope you join us on a trip soon!